It's week 4, which means all of your New England and Tennessee wide receivers will be out of the mix as bye weeks enter the frame. As hard as it is to believe, at this time next week, we will already be a quarter of the way through the 2015 NFL regular season. 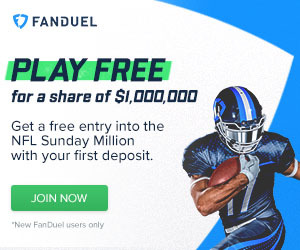 Just one more step closer to the fantasy football playoffs, where a strong group of wide receivers can help your team separate from the rest of the pack come postseason time, especially if you're taking part in a PPR league. There are some tasty matchups across the landscape this week, so we'll set the table and keep you informed of any injuries to key receivers as week 4 kicks off Thursday night with the Ravens and Steelers facing off in Pittsburgh. 1. Julio Jones vs. HOU- Julio continues to dominate, as the Cowboys found out on Sunday in week 3. He'll get a home matchup with the Texans in week 4, and will look to continue his dominant start to 2015. The Texans will likely look to keep things close by burning clock and leaning on the run, but Jones will be the apple of Matt Ryan's eye whenever the Falcons have the ball. 2. A.J. Green vs. KC- A.J. had a signature day in week 3, highlighted by a trademark 80-yard catch-and-run en route to an eye-popping 10/227/2 line. Look for him to keep on trucking against a Cheifs squad which struggled against Randall Cobb on Monday night. 3. Odell Beckham Jr. @ BUF- Young ODB has a tricky test at Buffalo, where Rex Ryan enjoys molding his defense to contain the opposition's most dangerous threat. The Bills have a terrific defense, but Beckham may be boosted by the potential return of Victor Cruz, and along with the presence of Rueben Randle, it will be tough for Buffalo to focus solely on him in week 4. 4. Randall Cobb @ SF- Cobb's 3 touchdowns helped the Packers dispose of the Chiefs on Monday night. He is Aaron Rodgers' main man in the passing game, which makes him a shoe-in top-5 play every week. 5. Antonio Brown vs. BAL- Antonio won't have Big Ben Roethlisberger under center for the next few weeks, but he's still a force to be reckoned with. Michael Vick knows how to get the ball to his playmakers, and Brown leads the line in Pittsburgh. He usually shines the brightest under the lights of primetime, and has that big stage again as the Steelers host Baltimore on Thursday night. 6. Demaryius Thomas vs. MIN- Not the easiest of matchups against Mike Zimmer's defense, but Peyton Manning's playmaking weapon is always a threat. Scored his first touchdown of the year in Detroit on Sunday, as the Broncos worked out of the pistol formation in order to further assist Manning and the offense. 7. Emmanuel Sanders vs. MIN- Have we mentioned Peyton Manning's playmakers before? Sanders is right up there, and should be a top-10 play against the Vikings. 8. Brandon Marshall @ MIA- Marshall has earned top-10 consideration on the strength of his early performances in 2015. He had a nice 10/109/1 line in week 3, and has found the end zone every game thus far in 2015. 9. 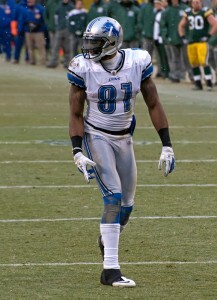 Calvin Johnson @ SEA- It doesn't get any more difficult than a road trip to Seattle, but Megatron is Megatron. He's seen a combined 30 targets over the last two weeks, and that volume should remain high, no matter the opponent. We can already hear the wise words of Richard Sherman barking Detroit's way. 10. Keenan Allen vs. CLE- Speaking of high volume, Allen continues to see tons of balls thrown his way. He has averaged 13 targets per game thus far, and will see plenty more against the Browns on Sunday. Calvin Johnson is rounding back into Megatron-like form. 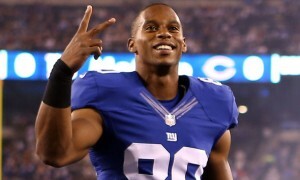 Victor Cruz is set for his season debut in week 4. Rishard Matthews vs. NYJ- Back-to-back 100-yard games and 2 touchdowns a week ago. Matthews is beginning to click with Ryan Tannehill. Golden Tate @ SEA- Revenge games are always sweet, especially if the player can deliver. Tate will have a golden (pun unequivocally intended) chance to shine against his old club, and could take advantage of extra attention paid to Calvin Johnson. Leonard Hankerson vs. HOU- Hankerson knows the ins and outs of Kyle Shanahan's offense, and has settled into his role quite well. Has outperformed Roddy White in consecutive weeks. Cecil Shorts III @ ATL- A former number one wide receiver in Jacksonville, Shorts has played well in Houston, giving Ryan Mallett another outlet when DeAndre Hopkins is covered. Best of luck to all in week 4.